American Foul Brood (AFB) is a bacterial disease and is caused by the spore- forming Paenibacillus larvae ssp. larvae and is the most widespread and destructive of the bee brood diseases. Larvae up to 3 days old become infected by ingesting spores that are present in their food. Young larvae less than 24 hours old are most susceptible to infection. Spores germinate in the gut of the larva and the vegetative form of the bacteria begins to grow, taking its nourishment from the larva. Spores will not germinate in larvae over 3 days old. 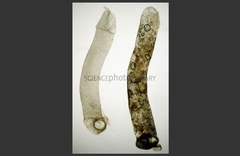 Infected larvae normally die after their cell is sealed. The vegetative form of the bacterium will die but not before it produces many millions of spores. Each dead larva may contain as many as 100 million spores. This disease only affects the bee larvae but is highly infectious and deadly to bee brood. 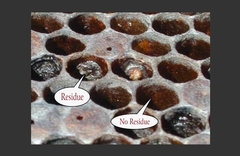 American foulbrood spores are extremely resistant to desiccation and can remain viable for more than 40 years in honey and beekeeping equipment. Therefore honey from an unknown source should never be used as bee feed, and used beekeeping equipment should be assumed contaminated unless known to be otherwise. 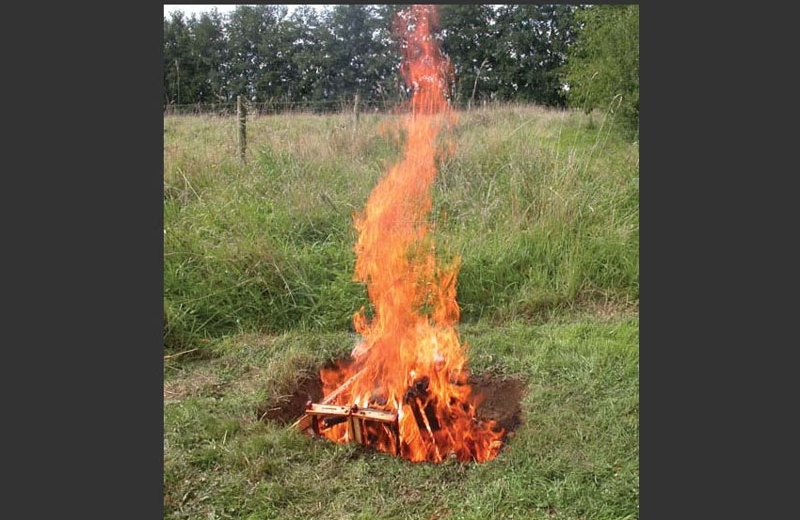 In the UK, American foulbrood is a notifiable disease and the only treatment is destruction of the infect hives by burning/fire. European Foul Brood (EFB) is a bacterial disease and caused by the bacterium Melissococcus plutonius. The bacteria multiply in the mid-gut of an infected larva, competing with the larva for its food. They remain in the gut and do not invade the larval tissue; larvae that die from the disease do so because they have been starved of food. 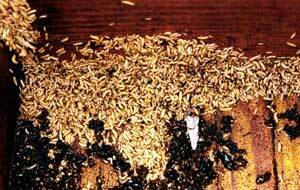 In hives infected with EFB, dying and dead larvae can become yellow and then brown. A sour, fishy odour may be present or not. The larvae can also twist as they die and can die curled upwards. Other times they melt in their cells and will generally be mushy. The remains can be slightly ropey with threads less then 1.5cm long. 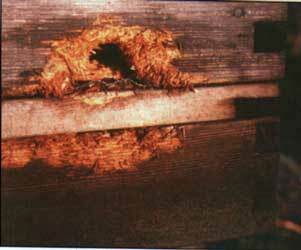 To test if the remains are ropey, a toothpick or match can be probed into the cell and removed. Once dried, a rubbery scale remains. In the UK, European foulbrood is a notifiable disease. Weak colonies or those with high infestation are normally distroyed as with AFB - however under certain circumstances treatment can be carried out using an antibiotic. 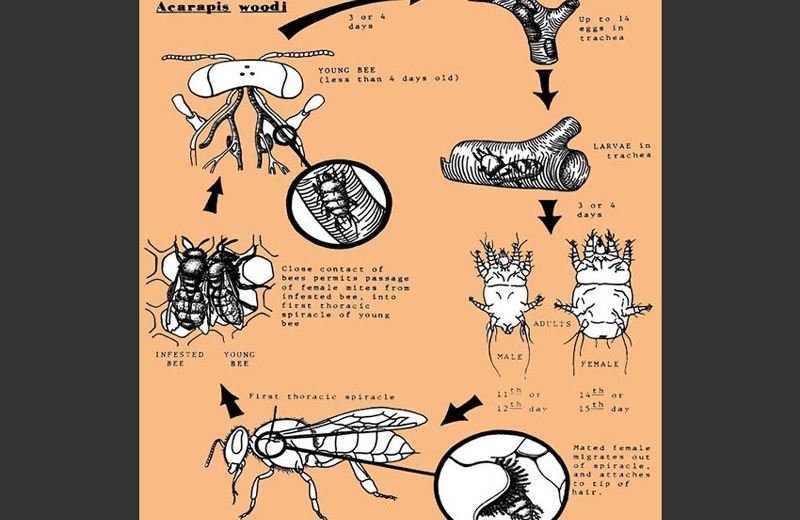 Acarapis woodi (or commonly known as Acarine) is an infestation the respiratory passages of bees by small mites. 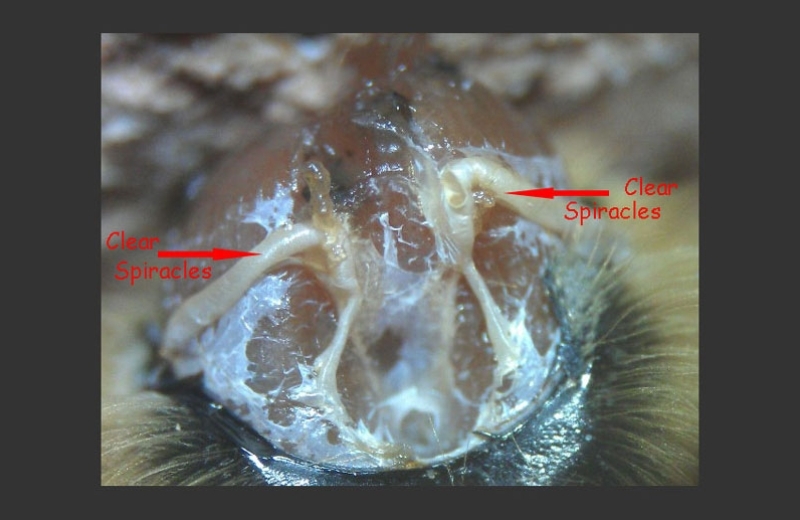 The bee must be dissected to expose the spiracles to enable any mites present to be seen, however if you remove the bee's head with a pair of scissors and using a good magnifying glass - you should bee able to observe if the spiracles are infected. Braula, Braula coeca or 'Bee louse' is a six legged wingless fly, are reddish-brown in colour and are often misdiagnosed as varroa mites. It is about 1.6 mm in length. The adults are often found on the heads of honey bee workers, drones, and especially queens. While on the heads of the host bee, the bee louse will feed on food from the mouth of its host as the host is fed by another bee or is feeding another bee. You can sometimes spot the bee louse in places where bees congregate such as flowers or salt licks, waiting to grab onto hosts from uninfested nests. 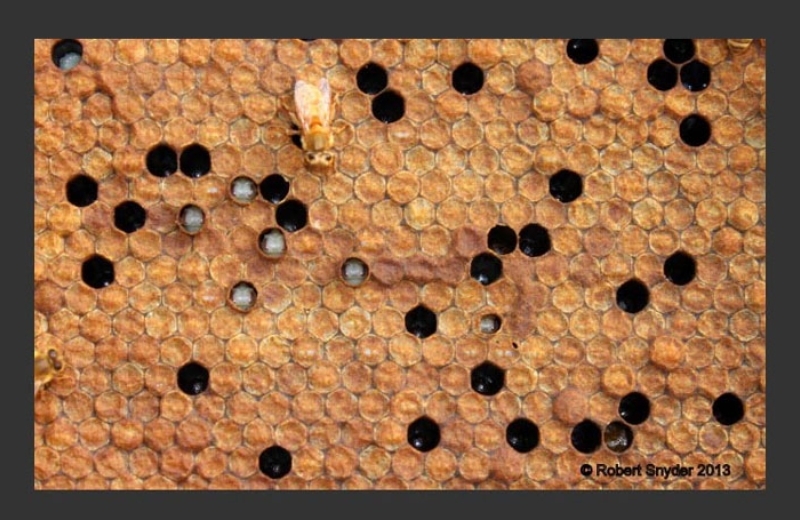 Female bee lice can lay their eggs (white and oval shaped) in various places in the hive (empty cells, brood cappings, debris on the floor) but only eggs laid on honey cappings will hatch. On hatching, the bee louse larvae construct a tunnel under the cell cappings. 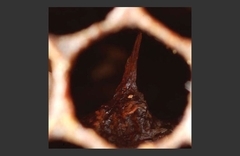 This visible tunnel is the most noticeable hive damage attributed to the bee louse. 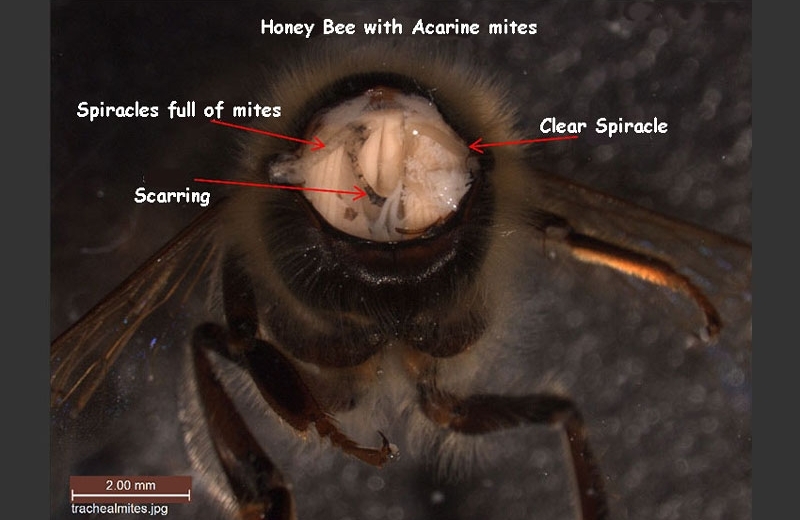 There is some debate as to whether the bee louse causes damage to the honey bee. 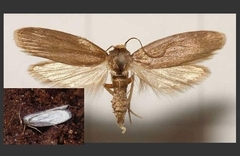 Wax Moth,There are two types of wax moth, the Greater Wax Moth – Galleria mellonella – and the Lesser Wax Moth – Achroia grisella. Both species can destroy combs, although Greater Wax Moth is much more damaging. Any 'dead out' colony either in the wild or those left unattended by beekeepers will have their combs completely destroyed. 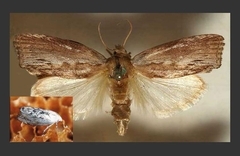 The adult female moth lays her eggs, which can vary from 300 to more than 1000, preferably in drawn comb and usually finding a crevice around the edge of the frame. Larvae hatch in 6 to 9 days depending on the temperature which then become very active caterpillars, tunnel through the combs leaving silken webs over the surface of the comb. After a period of pupation, adult moths emerge, mate and continue the infestation cycle. 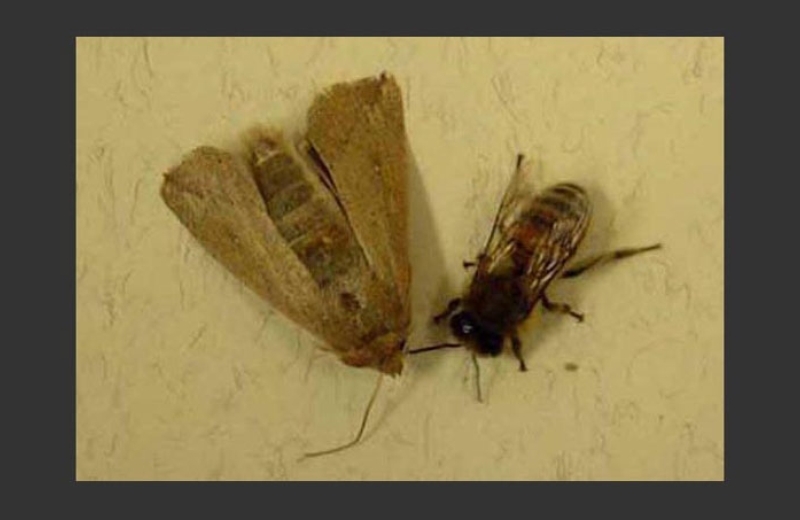 Strong active hives normally deal with the moth okay, but the weaker hives will often surcum to the moth. 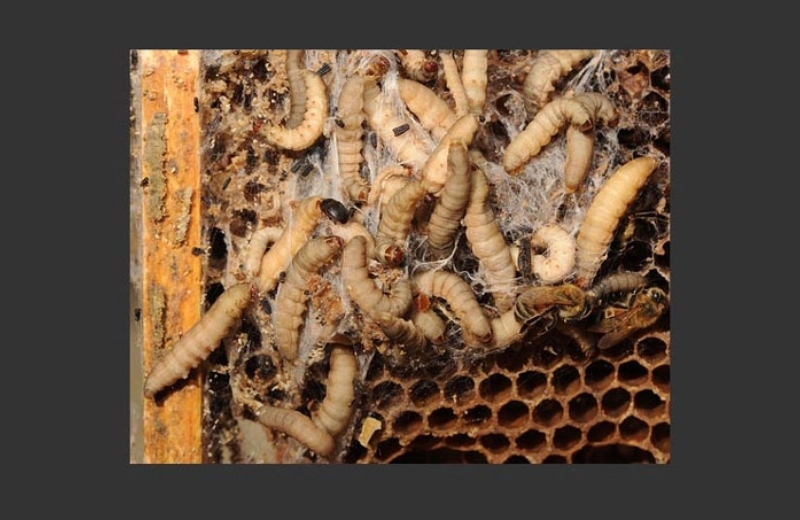 An interesting brood symptom you may come across in a weak hive in the spring is Bald Brood, which is caused by the wax moth larvae burrowing under the wax and in so doing removes some of the cappings. Fumigating your spare combs over winter with 80% acetic acid kills off the moth eggs and also nosema spores. Stack your spare boxes one on top of the other full of empty built out frames, place saucer of acetic acid on top of the frames in upermost box - seal with a crown board (all holes blocked) and leave. The acid evaporates and drifts downward. The Small Hive Beetle, Aethina tumida (Murray) (Coleoptera: Nitidulidae) is native to South Africa but is not regarded as a serious pest there. However, in the United States, where the beetle was first discovered in 1998, it has become a significant pest and causes serious damage to beehives. The beetle has spread to Canada, Mexico, Jamaica, Australia, Cuba and now Italy where it has proved it can be a very serious pest of European honey bees. There is an extreme risk of it's accidental introduction into the UK. Larvae of the small hive beetle can cause total destruction to honey bees colonies within a season. 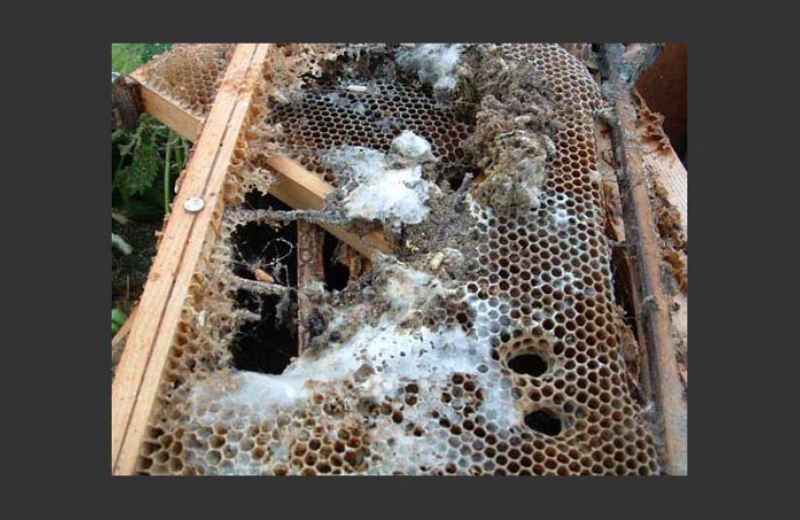 They tunnel through combs, eating honey and pollen and killing bee brood, completely ruining the combs. Heavy infestations cause bees to abscond; some beekeepers have reported the rapid collapse of even strong colonies. 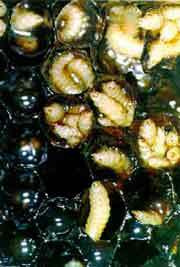 Worse, the larvae defecate in honey promoting fermentation. 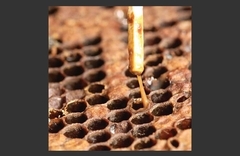 Fermented honey cannot be used by anyone and has to be destroyed. The beetles can feed on ripened fruit and, therefore contaminated fruit and cucurbits could provide an effective means for the pest to spread. Beetles have been recorded to fly up to seven kilometers. 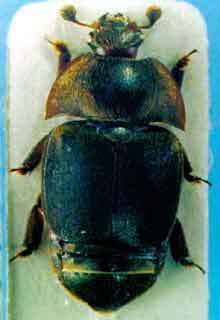 The adult beetle, which is the stage most commonly seen, is black or dark brown, ovoid in outline and about 5–7 mm long. They have clearly clubbed antennae and wing cases (elytra) shortened so that the apical few segments of the abdomen are visible. The larvae grow to 10–13 mm long, cigar shaped and pale whitish cream. Their most distinctive feature is the presence of two rows of short spines along the center of the back, with the last two projecting beyond the rear end of the larva. When fully grown, the larvae enter the soil in front of and beneath the hive to pupate. The Small Hive Beetle larva should not be confused with the Wax moth larva, which has a number of prolegs in addition to its thoracic legs and also spins web or cocoons. Larvae grow in the hives and mature by 21 days. 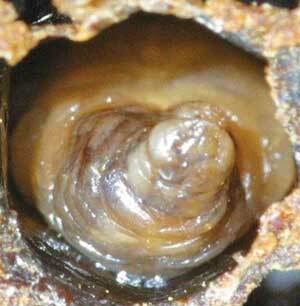 They feed on pollen and brood in particular, but burrow through wax and can feed on, and contaminate, honey as well. The mature larvae are attracted to light and leave the entrance of the hive to find soil in which to pupate. They burrow up to 200 mm deep into the soil, depending on the soil type. They prefer soft, sandy soil. In the USA, 100% of pupating larvae have been found within 900 mm of the hive. Not all larvae leave the hive – pupae can be found lodged in hives or stored material as well as soil. Most pupae hatch and beetles emerge within 60 days unless conditions are very cold (up to 100 days at less than 10°C). Emergent beetles are pale yellowish brown at first but darken quickly. They fly readily and are attracted to light. Beetles are strongly attracted to bees (even more so than hives/honey/pollen) and enter nearby hives where they feed. Beetles can fly well but technical detail on this is scarce. They are reported overseas as travelling with swarming bees. Adults can survive only about 5 days without food or water, but when removed from hives can complete a life cycle on various tropical and other fruits, including melon. While the beetle is spread mainly by the movement by beekeepers of beehives and bees, direct spread by flying beetles up to seven kilometers has now been seen in Australia. The beetle pupates in the soil, so the movement of soil from apiary sites could possibly spread infestation. 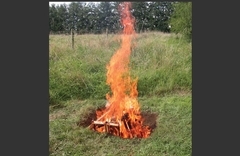 Wherever possible, contaminated hives should not be placed within 5–10 kilometers of other hives, to protect the uncontaminated hives from infestation by flying beetles. Weak hives and larger apiaries are more attractive to beetles. The life cycle and multiplication of the beetle can be disrupted by appropriate treatments. The UK government, in its ever increasing inspirational wisdom, has decreed that Honeybees may be imported from third world countries into the UK. These imports will be restricted to consignments of Queen bees and attendant workers only. Three of the countries listed ... you guessed correctly ... are South Africa, Australia and now Italy both rife with the small hive beetle. Varroa is believed to have been introduced into the UK with consignments of Queen bees and attendants. The import of ALL bees into UK should be prohibited. An account is given of observations at Pretoria on the bionomics of Aethina tumida, Murray, whish has been found in bee-hives in parts of South Africa. This Nitidulid was described in 1867 from Nigeria, and was recorded from Durban in 1920, but there is apparently no earlier record of its occurrence in bee-hives. It is probably widely distributed in tropical and sub-tropical Africa and is apparently commoner in the warmer areas of South Africa. 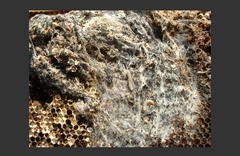 Though not a major pest, it sometimes becomes almost as harmful as Galleria mellonella, L. The adults collect mostly on the rear portion of the bottom board of the hive, where they can easily feed on the pellets of pollen that fall from the cluster of bees above, and are relatively free from interference. The larvae are particularly troublesome in weak colonies and in combs in storage. They feed on honey and pollen, and though they damage the comb, are less destructive than those of G. mellonella. All stages of A. túmida are briefly described. The eggs are laid in irregular masses, preferably in cracks and crevices, and pupation occurs in the soil beneath the hive. In breeding experiments, in which the Nitidulid was successfully reared in small tin boxes at room temperature, the egg, larval and pupal stages lasted 2-3, 10-16 and 21-28 days, respectively, and the adults survived for over six months. Five generations developed in the course of the year, but oviposition did not occur from mid-April to mid-August. 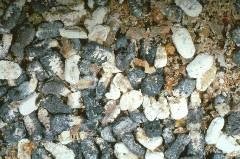 The number of eggs deposited by a single female was not ascertained, but two or three beetles in a pile of supers can cause a heavy infestation. The larvae did riot mature when supplied with honey only, but developed as rapidly on pollen as on a mixture of pollen and honey. 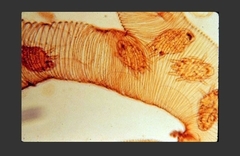 No evidence of parasitism was obtained, and although females of Microbracon brevi-cornis, Wesm., which parasitises the larvae of G. mellonella, readily inserted their ovipositors into larvae of A. tumida, no parasites were reared from these larvae, all of which died on the second or third day after being stung. Stored combs that are heavily infested with larvae of the Nitidulid can be fumigated with carbon bisulphide at a minimum dose of l oz to three deep Langstroth hive bodies. 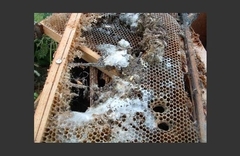 Combs that are only lightly infested can be returned to the bees to be cleaned, but those with heavier infestations should first be washed with a hose. Although the bees rarely succeed in ejecting the adult beetles from the hive, they have no great difficulty in removing the larvae from the combs. The Asian bee mites Tropilaelaps, (Tropilaelaps clareae, Tropilaelaps mercedesae, Tropilaelaps koenigerum and Tropilaelaps thaii), two of which are potential threats to UK beekeeping. The mites are native to Asia and have spread from their original host the giant honey bee, Apis dorsata, to the European honey bee A. mellifera. There is a serious risk of their accidental introduction into the UK. 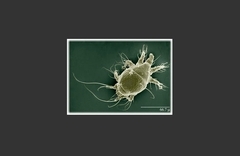 Tropilaelaps mites are notifiable pests under European Community legislation. All beekeepers should be aware of the details of the life cycle and how the mites can be recognised and controlled. The females of T. clareae are light-reddish brown and about 1.0 mm long x 0.6 mm wide, and the males are almost as large as the females (about one-third the size of a Varroa mite). 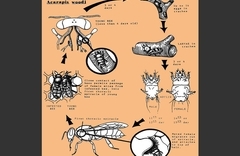 The life cycle and parasitism of A. mellifera is similar to that of Varroa destructor. 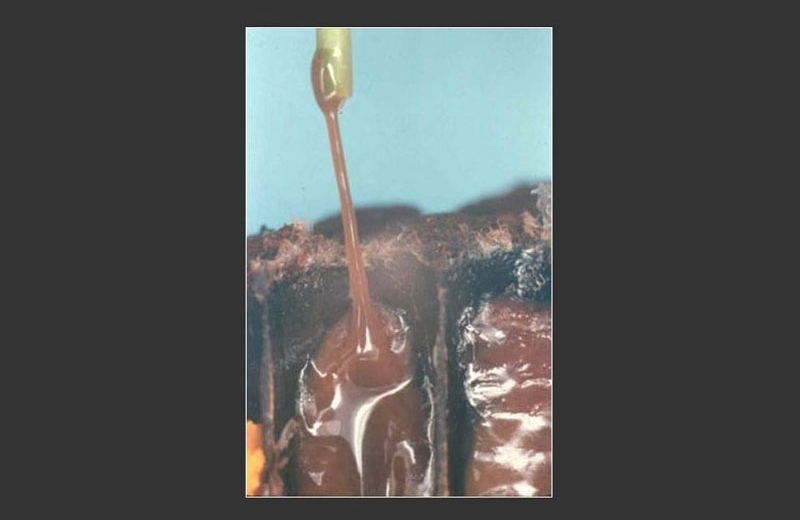 T. clareae readily infests colonies of A. mellifera in Asia, particularly where colonies produce brood continuously. 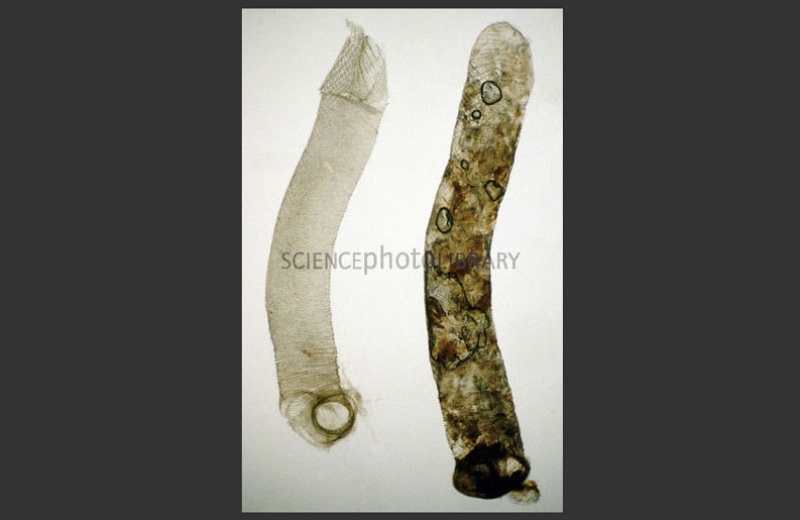 Adult female mites enter cells containing larvae where reproduction takes place within sealed brood cells. The mother mite lays three to four eggs on mature bee larvae 48 hours after cell capping. Development requires approximately 6 days, and the adults (including the mother mite) emerge with the hatching adult bee then search for new hosts. 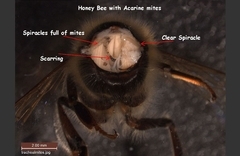 Mites move rapidly across the brood combs and are therefore easier to spot than Varroa, although they are much smaller. T. clareae has a shorter reproductive cycle than V. destructor, so when both mites are present in the same colony, T. clareae populations build up more rapidly. 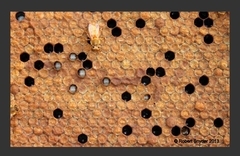 The majority of Tropilaelaps live and reproduce inside brood as they can achieve a longer life cycle there, living only about three days on an adult honey bee. 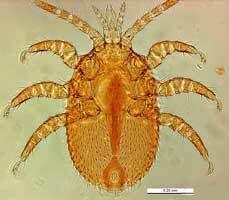 Perhaps the most alarming characteristic of the mite is its reproduction rate and breeding cycle. Within 24 hours of hatching the mites enter another cell and begin reproduction, laying about four eggs at a time. 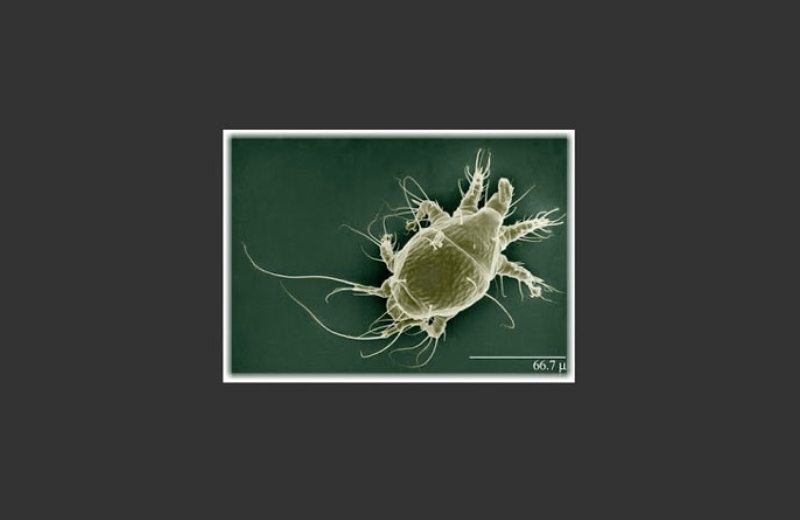 One to four mites are generally found in a cell reproducing at one time; however there are reports of mites being found in quantities over three times that many in just one cell! They can quickly outnumber and out produce Varroa mites in colonies, hatching in only 12 hours and reaching full maturity in just six days. Varoa shown on the left If you have Tropilaelaps mites, they are the only thing you need to be concerned about to say the least. 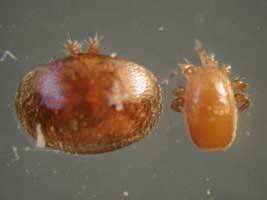 In comparison to Tropilaelaps, Varroa mites are no issue. Their damage to colonies is similar to that of the Varroa mite as they can cause developmental deformities, infections, and eventually death at a very rapid rate and because of their high reproduction rate they can multiply quicker than Varroa causing much more extensive damage. 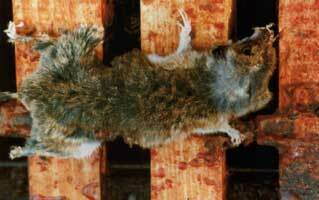 Chalkbrood is a Fungal disease and is a disease affecting sealed brood and is caused by the fungi Ascosphaera apis. The presence of chalkbrood is influenced by climatic factors, which influence the temperature and humidity in the hive, especially when it is cooler and wet. At first larvae are covered with a fluffy, whitish fungus growth. After death the larvae become mummified and have a chalk-like appearance; the colour varying from white, to grey to finally black. 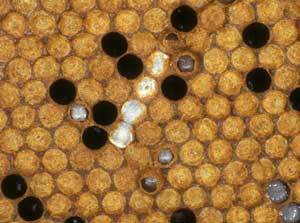 Each Chalkbrood mummy produces millions of spores that will adhere to cells and adult bees. It is these spores that are the infective stage of the fungus and may remain viable for up to 15 years. The spores can be spread from hive to hive by drifting bees, or by the beekeeper on equipment and frames moved between colonies. 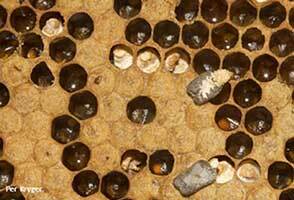 Chalk brood is not normally a problem in strong healthy colonies but smaller ones can suffer. In bad cases the problem may be solved by re-queening with a young and vigorous queen from a chalkbrood-free colony. Because the fungal spores remain on the comb and frames, it is a good idea to get into the habit of replacing2 or 3 of the oldest frames every year. Nosema is a highly specialised parasitic Microsporidian fungal pathogen and is found in two variants - N.apis and N.cerana, have both been identified in honey bees in the UK. Nosema spp. invade the digestive cells lining the mid-gut of the bee, there they multiply rapidly and within a few days the cells are packed with spores, the resting stage of the parasite. When the host cell ruptures, it sheds the spores into the gut where they accumulate in masses, to be later excreted by the bees. If spores from the excreta are picked up and swallowed by another bee, they can germinate and once more become active, starting another round of infection and multiplication. 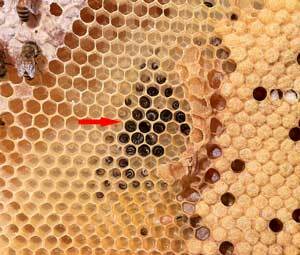 Damaged intestinal tissue is subject to secondary infections and "dysentery" (brown diarrhea spots on the combs and exterior of the hive) is a common sign of infection with N. apis, but not seen with N. ceranae. 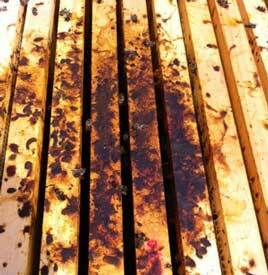 N. apis infected bees also defecate inside the hive, contaminating combs with millions of infectious spores. Worker bees that ingest spores when they are less than a week old normally do not digest food well and are not capable of producing brood food secretions. Infected bees tend to skip the brood rearing phase of life and become foragers at very young ages. Their life spans can be reduced up to 78%. Young queens that ingest Nosema apis spores normally are superseded within a month. Should you suspect N. Apis, a good field test is to take a bee - remove it's head and then seperate the thorax from the abdomen. If the liquid in the abdomen is creamy white, suspect Nosema. In a healthy bee you should see a reddish brown liquid. Treatment with the antibiotic Fumidil B ( now banned in the UK) inhibits the spores reproducing but does not kill the spores. An alternative remedy is the use of Thymol fed via syrup. A disinfection of the honeycombs and utensils with 80% acetic acid is recommended for an extensive disease outbreak. Dysentery is not caused by a pathogen, so it is not “catchable.” This is really a form of diarrhea that afflicts bees. It is not a disease as would be the ease in real dysentery, but a functional disorder due to too long retention of the faeces during winter, caused by bad food or improper protection, or both. The term "dysentery" is here retained, not because it is accurate, but because it has been used so generally in bee literature. About the only real remedy is settled warm weather. Even one good warm day will often serve to alleviate the trouble, as it gives the bees a chance to void their excrement out in the open air, away from the hives and the combs. Other wise the continued confinement during an extended cold spell sometimes compels the bees to retain their faeces so long that they are finally forced to void it over the combs and over the hives. Sacbrood is caused by a virus. In this case the virus prevents the larvae from making their final moult before pupation, after the cell is sealed. Again the larvae probably become infected via nurse bees when being fed. The dead larvae lie in the cell in a stretched out position in a fluid filled sac, that can have the appearance of a 'Chinese Slipper' with it's curled up toe. The larvae go through a change in colour, from yellow to black and finally dry out to an easily removed brown scale at the bottom of the cell. Sacbrood rarely has a major effect on a colony. It can appear to resolve as workers remove infected larvae from the cells. It can exist silently within the colony waiting for an opportunity to manifest itself. Control of Varroa and other hygenic measures are important to keep the colony strong and resistant to sacbrood. In severe cases, re-queening from a conolony free of this desease may help. Parasitic Mite Syndrome (PMS) is a condition that causes a honey bee colony to deteriorate and eventually dwindle away and die. There has not yet been a pathogen detected which causes the brood symptoms that appear with this syndrome. 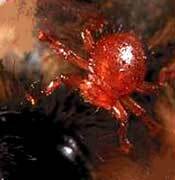 However there are always varroa mites present with this syndrome. The brood symptoms look similar to other diseases but the larvae don’t rope. 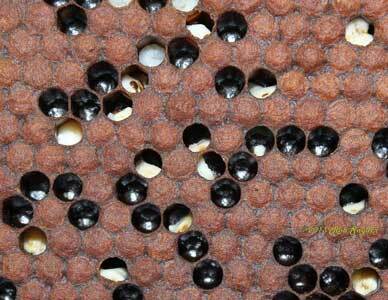 Colonies with PMS will show symptoms of white larvae that are chewed or pecked down by workers. Larvae may appear sunken to the side of the cell and may show symptoms of white with some debris at the posterior end. Pupa will be chewed down/removed or the pupa face chewed part of the way down as seen in the photo. Most of the symptoms shown are from hygienic bees trying to remove varroa mite infested cells and or larvae/pupa from cells. There is sometimes color to the larvae and this is attributed to age, decomposition or secondary bacteria. 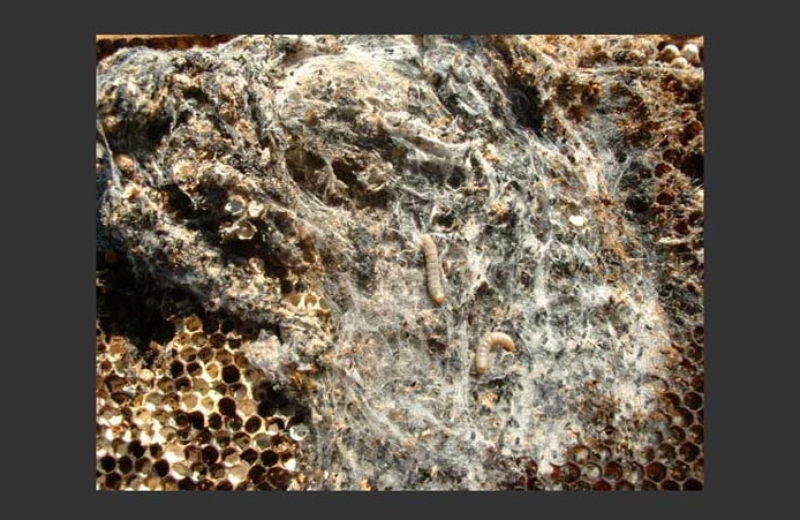 Baldbrood Wax moth larvae tunnel under cell cappings, causing worker bees to remove the damaged cappings. Larval tunnels follow a definable pattern along rows of brood cells. But it can also be attributed to a genetic fault in the strain of the bees. The exposed larvae contiue to develope normally and emerge as adults. To deter wax moth acitiviy, it is imperative to maintain strong healthy colonies. Chilled Brood ... Conditions that reduce the number of bees needed to keep the brrod nest warm, will result in chilling of the brood. Manhandling by the beekeeper, swarming, pesticide poisoning and starvation can all lead to this condition occurring within the colony. It is easily recognised as patches of brood of all stages will be dead. Normally brood deseases don't killl every individual larva/pupa present on a brood frame. The dead brood goes through a colour change from grey to black and dries out so the remains become easily removable. Mice will readily move into stored hive equipment and outdoor wintered hives. They feed on pollen, honey and dead bees, and may destroy large numbers of frames and combs while building their nests. Reduce colony entrance to 10- 12 mm in early Autumn and through winter so mice cannot enter. Do this with a 10 mm entrance reducer. Seal up cracks in stored equipment and store boxes on queen excluders, closed bottom boards, or pallets to prevent mice from entering. 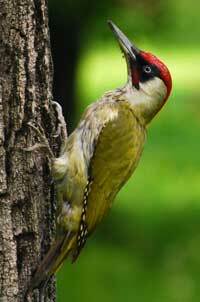 During harsh winters woodpeckers are forced to find food in apiaries, where beehives are kept. The birds will bore a hole through the hive wall to access any grubs they can find. You can keep the woodpecker from attacking by covering your hive with wire netting but not too tight to prevent the them getting too good a foothold. List of Varroa treatments registered and approved for use by the VMD"